Insert links anywhere in Moodle and the video will auto-embed for the end user. Follow this link to download the plugin files. 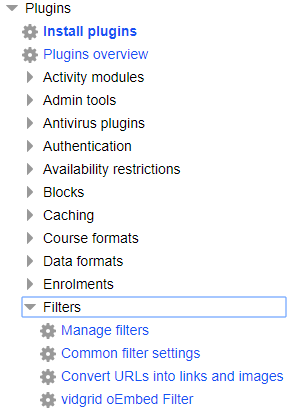 Login to your Moodle site as an admin and go to Dashboard > Site administration > Plugins> Install plugins. Upload your ZIP by drag and drop or select the zip file from your computer. Click "Install plugin from the ZIP file"
That's it! Now when you insert a VidGrid link anywhere in the rich text editor in Moodle, the video will be embedded into the field instead of redirecting as an external link.